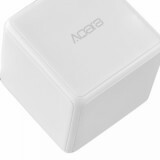 ET Aqara Magic Cube Controller is a smart home control center. Equipped with 6 kinds of motion orbit modes, it can effectively adjust the other Mi products, everything is in your control. 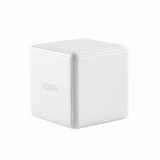 ET Aqara Magic Cube Controller is a smart home control center. Equipped with 6 kinds of motion orbit modes, it can effectively adjust the other Mi products, everything is in your control. You can switch the air conditioner by tapping it, turn it 180 degrees to turn on the sleep mode, turn it 90 degrees to turn on the purifier, shake it to switch the curtain, push it to turn the light on and off, and turn it to adjust the brightness. Different gestures can control different device, your magic life is coming. •6 hand gestures, push, shake, knock, rotate, over turn 90 degree, over turn 180 degree. •Made of high-quality materials, sturdy and durable. •Built-in 6 stage gyroscope, 6 actions to operate at any time, support blind operation of each side. 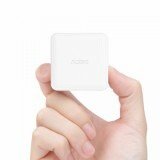 •Exquisite appearance and small size, can be used as a decoration. 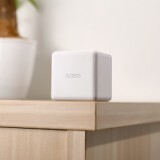 •Can control xiaomi electric appliances like lamps, smart TV, air purifiers, etc.